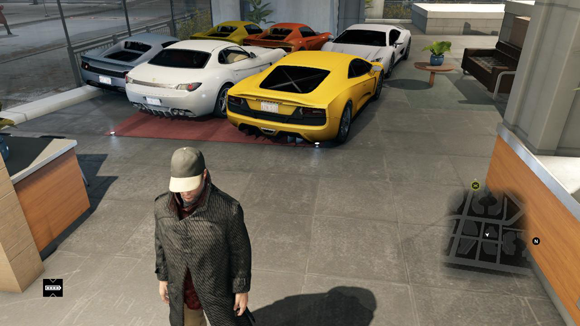 Meanwhile everybody playing ‘↵Watch Dogs‘ (Ubisoft Montreal 2014) seems to know about the dealer’s showroom in ↑The Loop where you can easily steal a ↑Scafati GT, the most lamborghini-ish of all ↑cars in the game. There are videos on YouTube and more information around the Net explaining the feat. Just walk into the store, enter a car, drive it through the glass panes of one of the floor-to-ceiling windows, and off you go. I already had driven two Scafati GTs, stolen on the street, but nevertheless wanted to see the showroom. How about filling up the showroom with sportscars, instead of stealing them from there? There’s no ↵suitcase to be found at the station, so something else has to be done in the game. The 336-TT to my eye is a mix out of a Porsche 959/969, 911 and an Opel GT—but the front’s shape definitely resembles a Lamborghini Miura. So it makes a nice pair with the Diablo/Gallardo and something else mix the Scafati GT is. Both being orange was a lucky coincidence. … the guy on the left doesn’t like orange or just has no sense at all for automotive history. Here you can see me just having delivered number three. Meanwhile it got dark and rain poured. The trick seems to be not to walk too far away from the showroom. As The Loop is a glitzy and wealthy ‘hood, chances are that you’ll find sportscars in close vicinity. No mods or cheats employed. UBISOFT MONTREAL. 2014. Watch dogs [computer game]. Montreuil: Ubisoft. I’m currently playing Assassin’s Creed 4: Black Flag and I’d love to give back all the ships I’ve boarded so far to their respective owners (and keep the rum hoho). But nobody wants to take them back. That bugs me all the time.